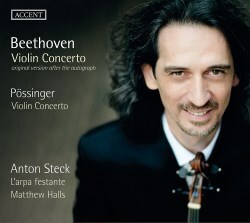 The CD case advertises this recording of Beethoven’s Violin Concerto as the world premiere recording of the “original version after the autograph”, and in the booklet notes they argue that the solo violin part of the concerto was all but lost after the original performance and that it now exists thanks to different printed versions that appeared later after an editing process had been put in place. Violinist Anton Steck has tried to reconstruct the original part and, yes, there are some textual differences in the solo part which you'll spot if you know the work well. As is often the case with these things, however, they make really very little difference (an extra run here, a slightly delayed entry there) so, unless you're an obsessive, they're not a deal-breaker for this performance. Much more important will be how you judge the sound of the performance. It's what I’d call an “aggressively period” performance. The sound of the orchestra seems to be deliberately rough around the edges, embracing the rawness with barely any attempt made to smooth it over or to chime in with our contemporary view of homogeneity. There is instrumental character as a payoff, with some very unusual sounding winds and brass, and the string tone is mostly satisfying. It's not really to my taste, however. That, of course, doesn't invalidate it as an approach, and it will definitely appeal to a certain market - I can imagine some describing it as “fearless” - but it goes a little too much in a certain direction for me. There are lots of period performances out there that tread a very successful halfway house between two extremes; an approach which this one largely eschews. It's hard to tell how much of that is due to the instruments and how much to the direction of Matthew Halls, who restrains the orchestral sound at the start of the Larghetto so much that it's almost as though he is ashamed of it. He plays with the tempo a little waywardly here, too, holding things back so much that you have to remind yourself you're not listening to an Adagio. At other times, such as the end of the Rondo, where the orchestra threatens to engulf the soloist completely, it sounds as though he is trying to fight a battle rather than play some music. Some will find that exciting but for me it's trying too hard to prove a point, and I found it wearing. Furthermore, Steck’s period violin isn't particularly pleasing on the ear either, its sound rather too scratchy or strained for my taste. He plays it mightily impressively, however, doing things in the cadenza that might remind you of some of the stories of those ultra-showy 19th century virtuosi who premiered many of these works, Franz Clement who premiered this work, for example. He's showy, but nowhere near as musically insensitive as those people were said to have been, and I must say that he won me over with some beautiful, uncommonly sensitive playing in the second half of the slow movement. His extra interpolated cadenza between the second and third movements is a bit daft, though at least it uses lots of Beethoven’s material well, and he ties it up with a very successful lead-in to the main Rondo theme. If anything, it’s the Pössinger concerto that is the more interesting part of this CD. Franz Alexander Pössinger was a friend of Beethoven, a publisher, a musician in the musical ensemble attached to the Viennese court, and a renowned arranger; and it’s possible that he was involved in the preparation of the violin part for publication. Consequently, it’s interesting to hear an example of his own original work. Well above the merely generic, this is a rarity worth reviving. His sound is closer to Mozart than to Beethoven, but you can hear the Classical world straining towards the Romantic clearly enough, most notably in the minor-key slow movement which has an operatic intensity that reminds me of Mozart’s Sinfonia Concertante; darkly focused, but very beautiful too. The first movement has serious musical business to do, not just repeated chugging, and the finale is a graceful, almost galant-style Rondo. Steck plays it with great commitment, almost as though it were Mozart, and this pays rich dividends. He clearly knows the style very well, and it seems to me that the orchestra are on better behaviour here, too; though, of course, I have no other recording against which to compare them. All in all, I found this a hugely satisfying performance, and it's probably for this that I'll go back to this disc most. I'm prepared to give the Beethoven another chance, however, though I can't say I'm looking forward to it.